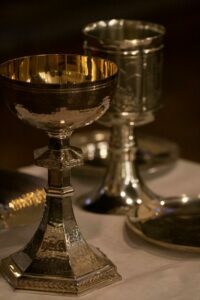 Holy Eucharist, Stripping of the Altar, & Procession to the Altar of Repose. The Chant Performance Workshop, under the direction of Marguerite Mullee, will present a half-hour Chant Meditation at 12 o’clock noon. Good Friday Liturgy. The Friday before Easter Day, on which the church commemorates the crucifixion of Jesus. The Great Easter Vigil. The Saturday after Good Friday, which recalls the day when the crucified Christ visited among the dead while his body lay in the tomb of Joseph of Arimathea. Choral Eucharist. Easter Day is the annual feast of the resurrection, the pascha or Christian Passover, and the eighth day of cosmic creation.